We know you want to take Albion with you to as many places as you possibly can. So we’ve made that happen; just browse this page for your favorite piece of merch and order them at the form below! Whether it’s sweater weather or not, you will always be comfortable in this amazingly soft Albion sweater. You can order one for only €20,00! So fill out the form below and we’ll get to it. This Albion Tote Bag will perfectly fit your daily university necessities. Unless you carry around all your Nortons at any given day; in that case we suggest you buy two. And hey, why not, they’re only €5,-. 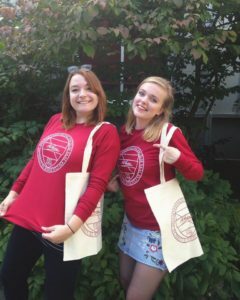 Want to order these cool Albion goodies? Just fill out the form and we’ll contact you about the payment details and when you may expect your order!